It didn’t take long for me to realize I was going to need a bag for all this knitting paraphernalia I’ve slowly acquired; throwing it all into the monstrous bag I’m currently using for a purse risked grave damage to in-progress items, and everything else just got Lost. Looking around online, I couldn’t find anything resembling what I wanted. Granted, I only looked for a few minutes. 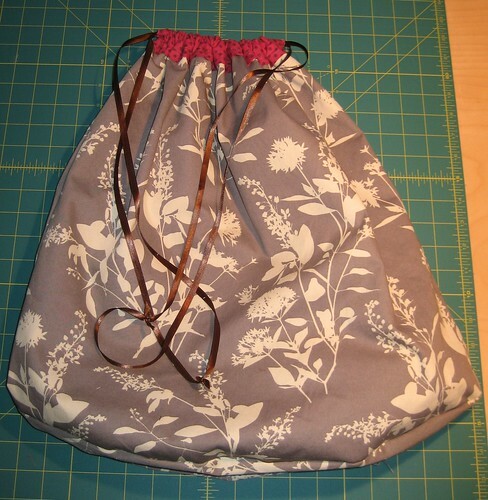 I wanted a drawstring top and some pockets inside. Something lined. Well shoot, I thought, I could just whip something up myself. The end product is a lot bigger than it should be, because I had a last-minute impulse of “what if I want to carry a giant sweater/scarf/whatever in there? !” Naturally, that is not likely to happen, but whatever – now I have a giant honking knitting bag. I started out with 20″ x 20″ squares of two of fabrics I’ve been saving – for the shell, I chose Ginseng for Westminster. 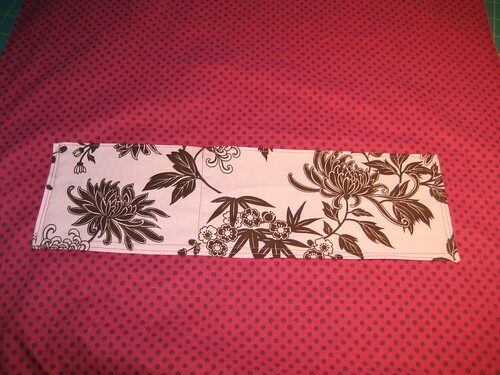 This is nearly identical to the fabric I made Stacey’s bag out of, and I may make one for myself, someday. This will kind of match, if I do. 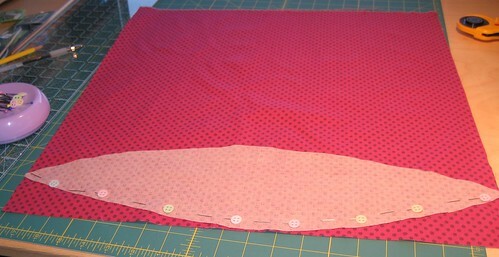 The Ginseng is a very muted fabric, and I wanted something bright and contrasting for the lining. 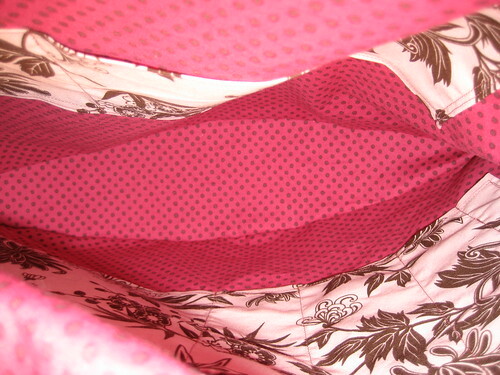 I’m not sure if the Wonderland deep pink polka dot (ah, beloved Moda!) really matches or not, but it sure does pop. I selected Robert Kauffman’s Night & Day for the pockets, and it was only after I’d cut them out I realized how they really didn’t match. Ah well, they’re on the inside! The more I thought about the bag and its purpose. the more I realized I’d probably want a flat bottom of some sort to help keep projects from really getting squished… but I also didn’t want to fuss with a square bottom and the ensuing side panels. Hm. I pondered for a few minutes and came up with the idea of a tapered bottom – if it tapered together at the sides, I shouldn’t need side panels, right? Right! Now. How to get the bottom panel drawn out… that took me nearly a half hour to figure out. I put points on paper 20 inches apart, found the center point, marked out the width of the fabric from there, drew a diamond as a starting point… and got totally, totally stuck. At the bottom, you can see my driving vision – yes, I am quite the artist. I couldn’t figure out how to get a graceful arc from point to point without some sort of… instrument. Be it a compass or a flexible curve guide, I had nothing, and I was stymied. In the end, I just sketched it out as best I could, realizing this was just a bag for knitting stuff, just for me, and no one would really be paying attention to it. Right on, off we go. Here are a few photos of the process. The machine really didn’t like the thread I was using, and we had several arguments over it. The Singer knotted and spewed and coughed and threw fits, and I couldn’t find my seam ripper. There were Words. I’m proud to report at no time did I sew anything on backward. This is somewhat of a noteworthy feat for me. 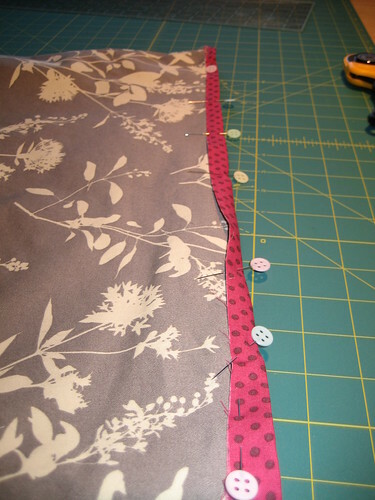 I paid no attention to seam allowances, and the pockets have double seams around the outside, because I opted to sew the folded-over edge down, instead of trying to keep it down whilst I sewed the actual seam. 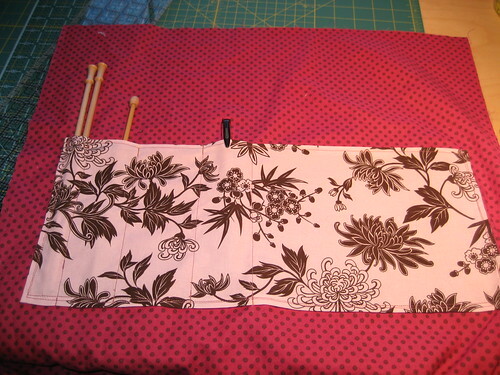 I should have placed the pockets lower into the body – my longest needles pop out now. Boo, sort of, kind of… I might like the fact they show a little. Maybe. Here, I am testing with Not My Longest Pair, because I forgot the other ones existed. I added a shallower pocket with only two division for things like stitch holders, clickers and the sundry other odds and ends one needs. I think I should have made it a bit taller, though. When I got the sides of the lining sewed together, I held my breath and turned it inside-out to see if it was, in fact, the sort of bag I’d imagined. Holy crap! It was! There was a flat bottom and everything. Next, I had to figure out what I wanted to do with the top. I looked at the bags Lisa sent me, seeing how she’d done her casing and drawstrings, and took my cues from her. Before I did the casing, though, I needed to fold over and stitch down the edge of the lining, since it would be on the outside. I got that sucker down, folded it over again a random amount, pinned it again, and sewed all around. 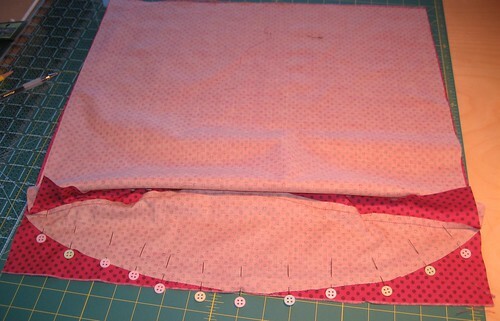 I ran out of bobbin thread an inch from the final topstitch. Grrrr. It is fairly enormous, not just something easy to bring along. Certainly not something I’m going to be able to stick inside my “real” bag, as I had envisioned. Heck, this could be both a knitting bag and my purse – I don’t really need much in a purse. Problem there being, I didn’t include straps – just ribbons. 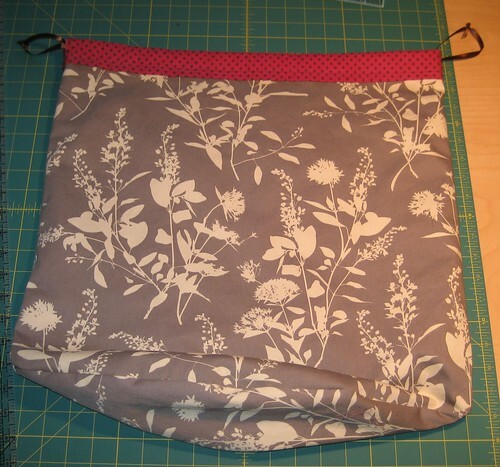 The ribbons are long enough to act as very thin shoulder straps… we’ll see. Next up, knitting progress post – because now, I know how to purl! Oops, I commented on the last post for this post. Great job! French Picnic is loving your craftiness! I guess you could make a couple of smaller project bags to go inside? I Love this bag! The pockets on the inside are a great idea. And the pattern, naturally and earthy. I had found some silk material at an incredibly low price and made a back pack type bag similar in shape. Turned out great, but the time it takes to hand sew is getting to me. 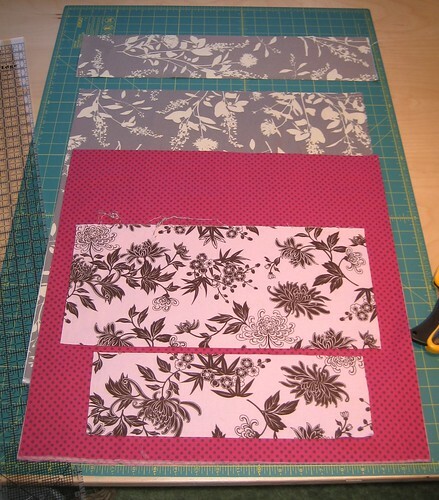 Alas I am finding time to take a basic machine sewing class. I hope to make a few more of these! But now I want to make one with inside pockets for my crochet needles! Great idea!